Social media matters for leads, sales and conversions. The link may not always be obvious, but it’s there. The latest statistics from Pew Research Center show that 74% of online adults use social media, and in the 18-29 age group, this number rises to 90%. Social media is also hugely important in ecommerce, as a Shopify study shows, with orders from Facebook increasing 129% in 2013. If you really want to maximize your returns from social media and improve conversions, it’s important to understand your social audience so you can create better personas to use in your marketing and deliver what your customers want. Luckily, most of the main social media sites have the insights you need. Here’s a snapshot of the data they provide and what you can learn to improve your conversion optimization strategies. One site you can’t ignore is Facebook, which has more than 1 billion users and, according to the Pew study cited earlier, is used by 71% of online users. If you have a business page, then there are a lot of stats for you to look through. When you visit the page, there’s a snapshot on post reach, post engagement, call to action button clicks and website link clicks. That’s a quick way to find out if you’re reaching your audience. 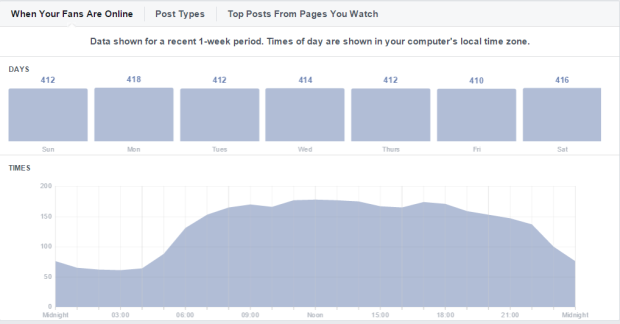 But if you want real value from Facebook, dig down into the insights tool and look beyond the overview. Here are some of the areas I find most interesting. 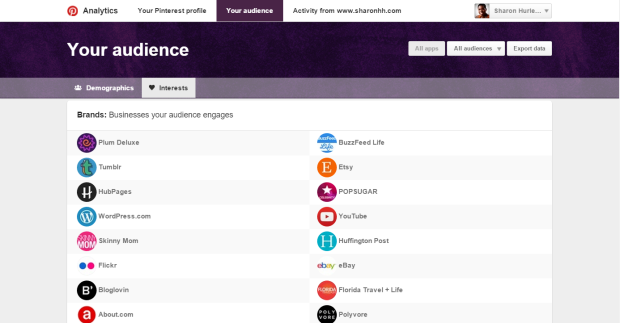 When you’re in the insights section, the “people” tab shows you key demographic information for your audience. Apart from gender and age, you can also learn about the country, city and language of page visitors. Check the charts to see if there’s a difference between the demographics of your overall fan base and those of the people you are actually reaching. If they are similar, then it’s a sign that your audience targeting is right. It’s also worth looking at insights into who’s actually engaged with your content. If your fans are women aged 35-44, but it’s mostly women in the next age band that are engaging with content, this may change your conversion optimization strategies – and your marketing. It’s also useful to check insights into when your fans are online. Combine this with Kissmetrics’ Science of Social Timing study to work out the best times to share content to reach, engage and convert your fans. Explore the difference between your overall fan base and engaged fans. How does this compare with the people that you’re actually trying to reach? Check for similarities in the types of content that people are engaging with. Reset your Facebook posting schedule based on when your core audience is actually online to improve your chance of reaching them. If you are using paid Facebook advertising, add a conversion pixel so that you will specifically know which ads are driving conversions. Explore statistics on the most engaging content (or take a shortcut and just assume that it’s images and video). Integrate these into your content marketing strategy for improved attention and conversions. Use a call to action on your Facebook page and pay attention to the statistics on how many people are clicking it. Check the results of Facebook ad campaigns to see if the results match what the insights tool reveals about your audience. Now, let’s look at Twitter. According to Pew, Twitter is used by 23% of online adults. 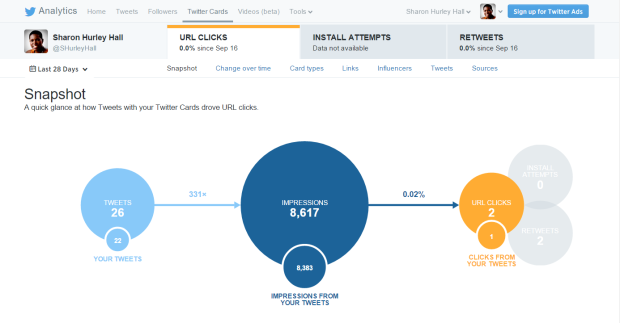 You can reach the rich data it provides via Twitter Ads, via the link in your profile or by visiting analytics.twitter.com. Within the analytics interface, there’s an overview of demographics, lifestyle, consumer behavior, and mobile footprint and then you can drill down even further for additional insights. For example, you can find out the top 10 interests of your audience, and get info on types of occupation, gender, income, marital status, net worth and even buying styles. 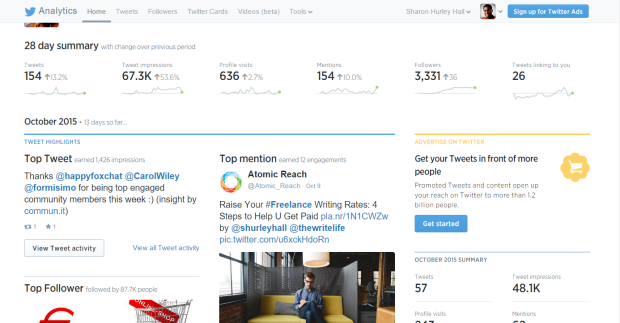 There’s also information on the performance of your tweets, Twitter cards and videos which can help a lot with understanding engagement. Based on the average income of your Twitter followers, have you got the pricing right? Are you getting the mobile conversion rates you expect? Twitter provides info on mobile device usage to help with better targeting. Compare the overall profile of your followers with the profile of your organic audience (the people you have actually reached). Is there a mismatch? Check which tweets had the most success and use those as inspiration for new ones. 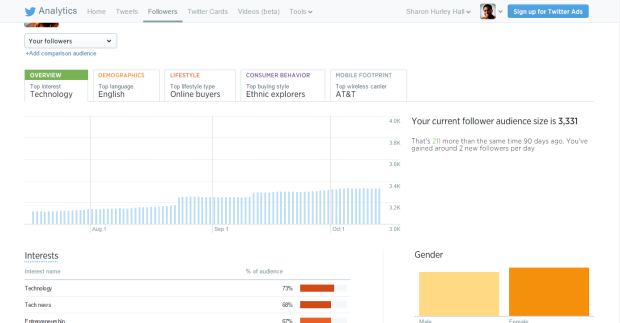 Check your customer personas to see if they match the insights Twitter provides. Finally, let’s look at Pinterest, which is used by 28% of online adults and is known to have a strongly female demographic. 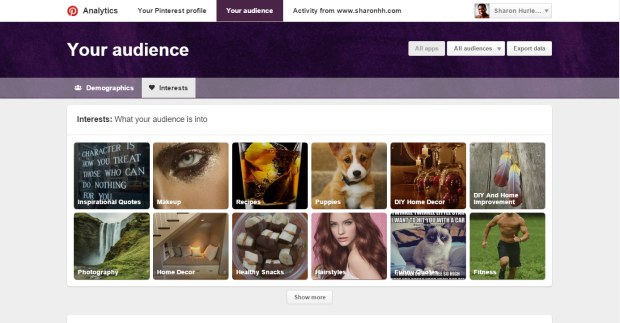 If you have a Pinterest for Business account (and why wouldn’t you?) then you also have access to analytics. As with the other sites, demographic info is a good starting point. You can find this in the “audience” tab, where you can learn key geographical information as well as data on how many people have seen your pins and are engaged with them. I particularly like the rich data in the “interests” tab, and the fact that since Pinterest is so visual, you can actually see what interests them. It’s also worth checking out the stats on who’s been pinning your content (a sure sign that they like it and are engaged with it). And you can check out on-site activity, looking at views and impressions over a given period. Which brands your audience is most engaged with. The all-time report which tells you which pins are most shared, which pins rank highest in search and which pins have overall engagement goodness. 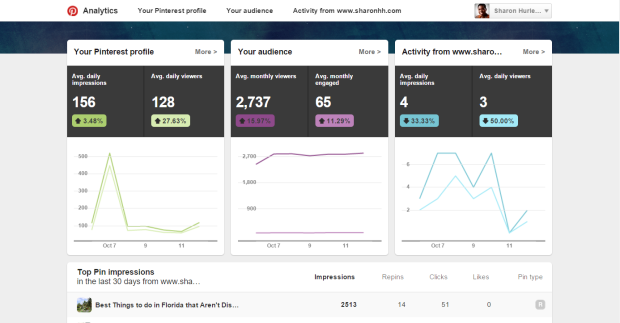 You can also see activity on your Pinterest profile, which is interesting even if your main goal is getting people back to your site. Use the statistics on the categories and pins that most engage your audience to deliver more of what you already know they want. Ensure that all pins have a link back to the source (or a landing page). Check out the brands that your audience is most engaged with and see what strategies you can learn from.